I place some markers and went to work knitting. The results are so much better than I envisioned—This is the nicest cowl I think I have ever knit! Do you like it too? 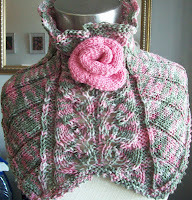 Well-- it will be up on Ravelry, the pattern for sale, before the day is out! I dyed the skein of Patons-- See the previous post for details. 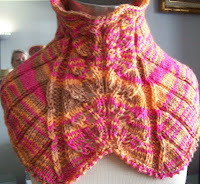 But I think this cowl/collar would look also look lovely in a semi solid yarn, or even in a simple solid. Some soft luxury yarn, that you can only afford a single skein of—for example—one that needs a special project. I added a rose, because I thought the soft red and green color way was similar to the foliage on a rose bush—and I thought a rose was the perfect little embellishment and finishing touch. 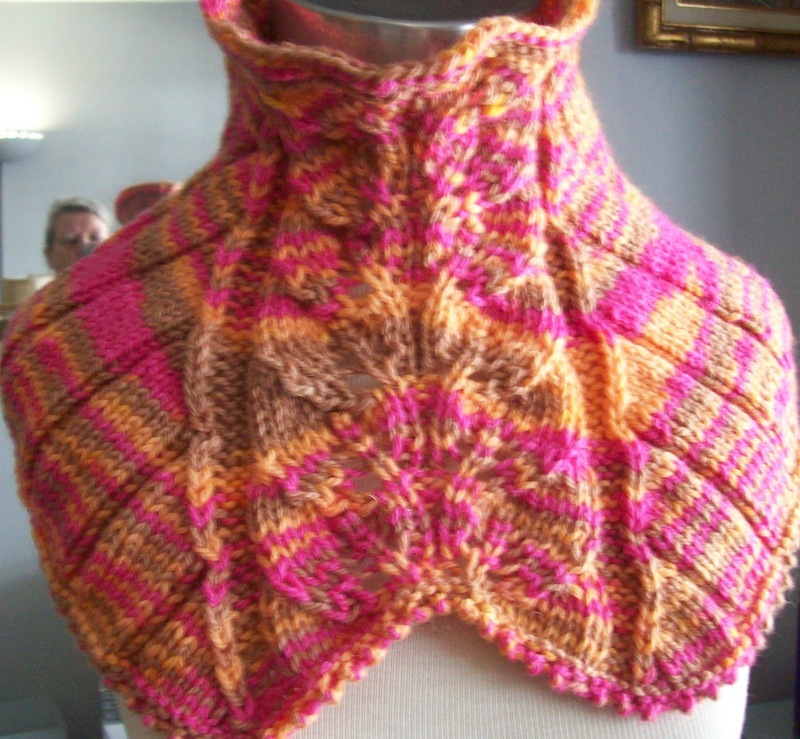 But it's optional-- I think the second example of the cowl—with out any added embellishment is lovely all on its own. The pattern for the embellishment is not included—but I do have a free pattern for a similar rose availability on Ravelry.com—it's shown as stick pin, but it's easy to make it into a pin on flower. 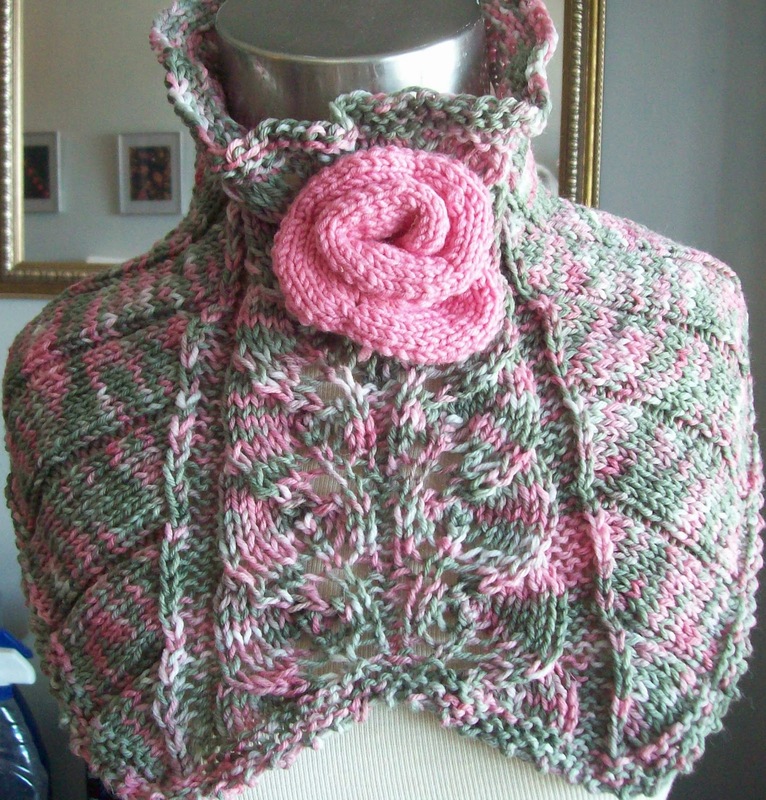 The pattern includes both written out and charted directions for the lace, and links: to the free pattern for the knit rose, and to directions for the suggested cast on (Channel Island)--all on two pages. A third page (optional to print out)—includes 4 full color photos. There is a thumb nail image included on the first page. Cowls are small and fast to knit, and this cowl is no exception. I think I want to knit another, or maybe 2 more. I think I could knit and embellish a half dozen before I got bored. Think how pretty it would be in a peacock blue, (a solid or a color way of the same) with a peacock feather pin added! Or in jewel tones, and a ornate piece of jewelry pinned center front. Oh, the possibilities are endless. Glad to see you are sharing the pattern. I love them both. Great job. Those are so beautiful! I'm sorry I've been away not reading much. Kudos for your creative works! If a cowl can be dressy, that's a very dressy cowl. Love! Lovely design, and beautifully knit!